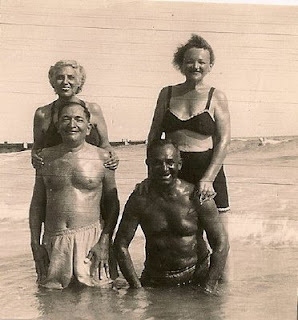 In 1947 my great grandparents Barney Newmark, Bertha Cruvant Newmark, Herman Feinstein and Annie Blatt Feinstein vacationed in Miami with children and grandchildren. The two couples were friends before their children, my grandparents, Mel Newmark and Belle Feinstein were married. Miami in the 1940s wasn't known for tolerance, and my great grandparents, particularly the Feinsteins, would have had difficulty with some hotels and restaurants from their names alone. But family lore says their difficulties grew as their vacation lengthened, due to a genetic trait of my great grandfather Herman Feinstein. I think these photographs are illustrative. The Feinstein family originated in Poland, and Herman Feinstein's skin color was indistinguishable from his wife's and in-laws during most of the year. I don't believe he got this dark in normal St. Louis summers either. What do you know about Herman Feinstein's origins? Were they in Spain or North Africa, or even Ethiopia? Or did he just tan well? Too much melanin or something. Did any of his offspring have dark skin? Do you know anything of his parents? I added a paragraph to the entry to clarify this. He wasn't usually this dark. I'm not aware of any descendants who tanned to this extreme, though some more moderately. My Grandfather Hughes tanned like Herman. 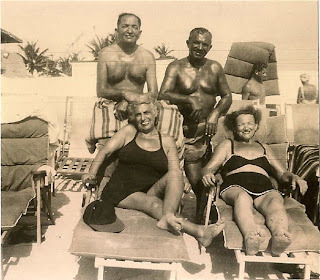 My grandparents did not vacation at the beach much as their children were growing, but in the early 1960's following retirement, they relocated to St. Petersburg, FL. Photos of him show a very dark tan once he lived in the Florida sun. Great photos and story, John. When I was a kid living in a mostly Jewish-American neighborhood, one of my best friends tanned dark in the summer and had a few fights because of it. His father tanned dark as well, but the other kids in the family didn't.